"We needed to create an exciting visitor experience that represented King Richard’s story with the utmost historical accuracy, whilst still retaining the element of drama that had captivated the public." Challenge: Using a range of media, the King Richard III Visitor Centre needed to create an exciting visitor experience that would bring to life the incredible, almost unbelievable, detective story of the last Plantaganet King’s life, death and discovery. Solution: Sysco Productions installed thirteen EH505 projectors across the visitor attraction with 7th Sense Delta Nano media servers, proximity sensors and audio equipment to create an immersive experience. Results: Through its highly contemporary AV, the Visitor Centre re-creates a medieval world full of political intrigue and the gruesome reality of battle balanced against clinical ‘scientific’ displays and the quiet graveside area. In 2012 the University of Leicester Archaeological Service, supported by the Richard III Society and Leicester City Council, excavated a council car park on the site of the friary where it was believed the king was buried after his death on Bosworth Battlefield in 1485. Against all odds, the university uncovered his remains and announced their sensational identification at a live TV press conference. Using a range of media, a new visitor centre, housed in an old school by the car park, needed to bring to life this incredible, almost unbelievable, detective story of Richard’s life, death and discovery. The Visitor Centre’s dark and “medieval” ground floor needed to use projected imagery and sound to present Richard’s troubled life from childhood to kinghood and then take visitors into the heart of battle. 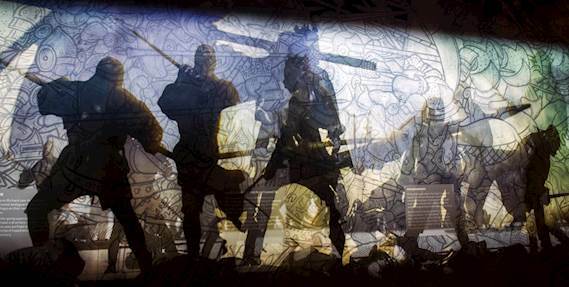 Portraying the bloody battle and the king’s final moments needed to be dramatic and powerful so would be shown as two filmed sequences projected onto two opposing semi-reflective metal fretwork screens, each 6 metres wide. In contrast, the bright and “modern” first floor would explore the facts and fiction from his reign including the myths fuelled by Shakespeare, the archaeological dig and the science behind the identification. All AV equipment including the projections, lighting and sound needed to be perfectly synchronised, easily controlled via an iPAD and 100% reliable. The projectors to be used throughout the exhibition areas needed to be high resolution, bright and discrete, as the ceilings, particularly on the ground floor, are low. 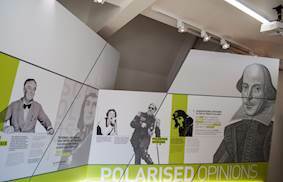 Imagemakers was appointed as Creative Directors for the Visitor Centre with the audio-visual and interactive media content produced by Centre Screen. Sysco Productions was responsible for the installation and commissioning of all AV equipment and show control. At the start of the journey, the visitor is plunged into a large scale AV set in an arched great hall, where characters from Richard’s early life introduce the story through a series of theatrical ‘acts’. The ‘royal throne’ dominates the room and a projected manuscript scroll unrolls on the floor, providing a time-line of events. Four EH505 are warped, blended and stacked to create the historical re-enactments between each of the arches. 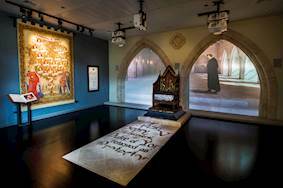 he death knell for Edward IV leads visitors through a dark panelled hallway through to a medieval world with illustrations inspired by medieval art, “gold leaf” panel and stained glass. A sword “swingometer” sways between Richard and Henry Tudor. Visitors are then immersed into the heart of the historical battle with two films projected at 4K resolution onto 6-metre wide etched metal fretwork screens in the gallery space. The brutality of the battle, the sheer force of the armies and the crushing atmosphere of battle can be felt in the space. The projections make the action literally ‘jump’ from the first screen to the second, with horses’ hooves flying over the audience to The Last Charge, which depicts Richard’s final moments. There is also a Victorian theatre style touchscreen game encouraging visitors to decide upon the fate of the princes in the tower, manual interactive shields which reveal facts about the battle and a 3D printed model of the Blue Boar Inn from which Richard rode to battle. In contrast to this, the Visitor Centre’s first floor is bright and “modern”. It explores the myths fuelled by Shakespeare, the Ricardian advocacy of “rehabilitation”, the archaeological dig and the science behind the identification. On returning to the ground floor, visitors are able to see Richard’s original grave. The grave site is a serene space of stone and gold. Under a glass floor, the grave and the original tiled floor are illuminated and a gobo light silhouettes the skeleton’s position. Sysco used thirteen EH505 projectors throughout the exhibition. This 5,000-lumen projector was chosen because of its flexibility both in terms of projection capabilities and installation. With WUXGA resolution and powerful image blending tools, the EH505 delivers spectacular image quality and outstanding brightness. It features DLP® technology, pioneered by Texas Instruments, which produces high quality imagery that does not suffer colour degradation over time, as sometimes experienced in other projector technologies. The dust-sealed, filter free design prevents dust and dirt from affecting the system ensuring optimal image quality with minimal maintenance. This provides ultimate reliability in its 24/7 operation. The projector has multiple lens options, with zoom and focus adjustment to get the exact image size needed, while the wide lens shift range and off axis short throw lens option gets the image exactly where it is wanted. 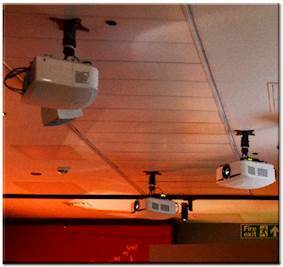 7th Sense Delta Nano media servers provide the complete video playback solution for the projection. They also maintain the synchronisation and triggering of media with frame accurate dependency and frame-accurate lighting cue triggering. The Visitor Centre opened in July 2014, less than two years after the king’s miraculous discovery. It has been well-received by over 80,000 visitors in its first year of opening, with excellent visitor feedback and media coverage. It has won the British Guild of Travel Writers “Outstanding New Tourism Project”, was overall winner at the East Midlands Forum for the Build Environment Awards and was named on Lonely Planet’s “World’s 26 hottest new experiences” for 2015. The AV design throughout is highly contemporary, supported behind the scenes by cutting edge networked technology that enables remote monitoring, informed maintenance, and the easy updating of content. 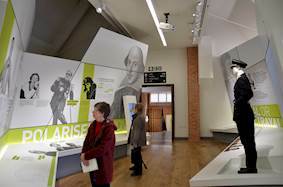 Iain commented: “The Visitor Centre tells an incredible, and also controversial, story of the life, death and discovery of King Richard III, in a balanced and original way." “Through AV we re-create this medieval world full of political intrigue and the atmosphere of battle balanced against the clinical ‘scientific’ displays and the quiet and contemplative graveside area." The centre has capitalised on the huge interest in the story of King Richard III, and his re-interment in Leicester Cathedral in March 2015 and promoted local pride and an interest Leicester’s story.